Research never seems to finish. In the 1994 issue of the Hay Bay Guardian, the story of Samuel Coate was given [see “Samuel Coate; A Fallen Meteor,” pages 11-18]. He served over ten years in Canada, married a niece of Barbara Heck, and was the chief instrument in building the first Methodist chapel in Montreal, touring England and the States to raise funds for it. At that time we had no dates of his birth or death. “In 1810, being too infirm to do the duties of a circuit, and feeling some delicacy about asking a supernumerary station (supposing that some in the conference might be opposed to it), he took a location, but afterwards was in such distress about it that he could not rest day or night, for it was like tearing a limb from his body to be separated from the travelling connexion, which he loved as his own soul. 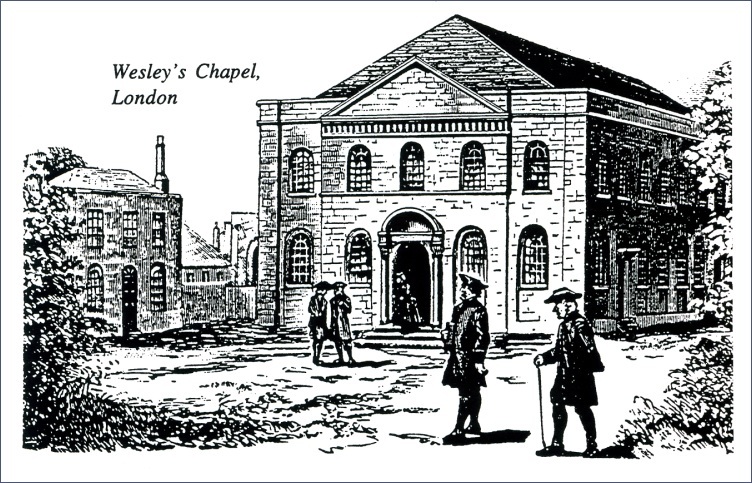 Wesley’s Chapel in City Road, was built to John Wesley’s directions in 1777-78. Behind the chapel is a burial ground where Wesley was buried in 1791. He had once said “I should like to be buried here, and on the morning of the resurrection rise with all my children around me.” The latter phrase refers to the hundreds of Methodist preachers also buried there, including as we now know, Samuel Coate. A recent letter from Mr. Peter Baugh, Heritage Steward of John Wesley’s House and The Museum of Methodism, enclosed the burial record of the Chapel, which shows that “Rev. Samuel Coats” died 20th December 1813, age 38 years, and was buried on 31 December in grave No. 2615. He had been living in Knightsbridge (the street which runs south of Hyde Park), and a Mr. Hatchet of Westminster was the undertaker. The standard fee for the cost of the grave was one Guinea (one pound plus one shilling). Excavations in the 1950s revealed that below ground in the Chapel precincts is a honeycomb of vaults and bricked-in tombs full of lead coffins—over 5000 burials, the last being that of Dr. Jabez Bunting in 1858. Nevertheless, Asbury, who often said, “Live or die, I must ride!” did pursue his rounds until death and glory finally claimed him in 1816, at age 70. In the old Methodist cemetery in Lumberton, the first row of stones behind the former meeting-house are those of the Coate family. There lie Daniel Coate (d. 26 October 1802, aged 63 years) and his wife Sarah (d. 12 July 1825 in her 80th year), the parents; alongside two of their three sons, Rev. Michael Coate (d. 1 August 1814, aged 47 years), and Asahel (d. 16 March 1814, aged 34 y, 8 mos., 7 dys.) with his 2 wives and 3 daughters. Many thanks to Bob Steelman who so generously gave of his time to look up this material. We get a more personal glimpse of the power of his preaching from the following eye-witness account written by Rev. James Newell, a local preacher on the Salem circuit in southern New Jersey. The camp meeting was held in Brewer’s Woods on his circuit in 1809. Coate was then Presiding Elder of the Lower Canada District.